Features Unique, Free Premium, Elegant, White, Gray, 4 Column, 1 Left Sidebar, Top Navigation Bar, Custom Menu, Widget Ready, Fluid Width, Wordpress Look etc. Vasiliki Blogger Template is another beautiful blogger template which is modified and converted from WordPress template. 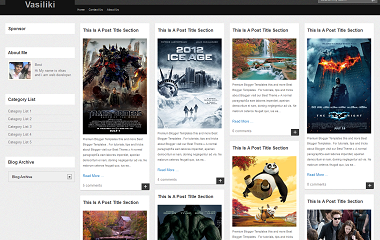 Vasiliki Blogger Template is a blogger theme is a jQuery masonry – A dynamic grid layout plugin and. It re arranges the content grids in a brick fashion with smooth animation according the browser window size. This is very nice template with is a very good if you are writing your news blog and want to share different updates, images, videos and more with world then this is a template for you. Now set the timestamp format to monday, october 13, 2010. And add link widget to it and remove its title. Go to layout and click on add new widget on the top of posting named 'Sponsor'. And add link,image,title to it. Go to layout and click on add new widget on the top of posting named 'Banner 468'. use images not less than 600px, don't worry for the larger one it will resize automatically but when you place a smaller image this will expand to optimised image size and it will look realy bad. So use image larger than 600px. And never use any text editor for posting like word or pdf because they have a special formating and when you paste these codes in the blogger editor, the parent formating remains same as it is. And blogger don't understand about that formating. This will cause your image look bad or something you have not written will show as summury on homepage.